So my favourite cooking book in the world is Stephanie Alexander’s Cook’s Companion – if you only ever buy one cookbook, this is it, seriously. 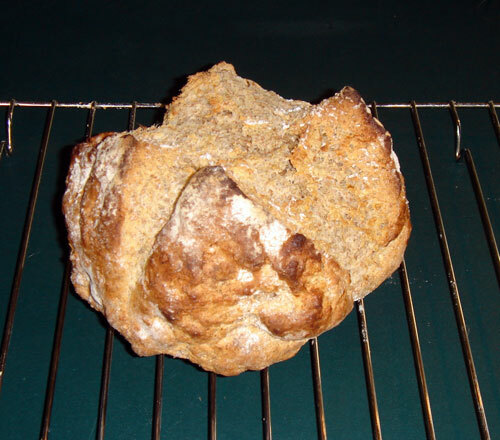 I’ve just discovered a recipe for soda bread that’s quick and easy, but still delicious. Stephanie credits Darina Allen for the recipe, so I’ll credit them both here. Preheat oven to 230 degrees C. Sift flour salt and bicarbonate of soda into a large mixing bowl. Make a well in the center and pour in the buttermilk. Using one hand, mix quickly to a softish dough. Tip onto a floured board. Wash and dry your hands (they will be very messy from the mixing) and then knead dough briefly to shape and neaten loaf into a round. Flip onto a heavy baking dish and pat into shape. Darina cuts a cross about 2cm deep across the top of the loaf to let the fairies out but it also helps it expand and cook evenly. Brush the top with the extra buttermilk and sprinkle with flour. Bake for 15 minutes at 230 then reduce the heat to 200 degrees for another 20 minutes. You can test by tapping the bottom of the loaf – if it sounds hollow it’s done. I’m not sure how long it keeps for because ours seldom last long enough to get cool from the oven. I did manage to save some once until the next day and it toasted beautifully. I thought all Irish people (like Darina) were born with the ability to make soda bread but I’ve posted this for a certain Irish friend that needs to know the recipe….something about coals to Newcastle springs to mind..eh Niall?